In this post, we will try to bring forth the details of next part of the Value Chain – Construction. Once a person has cleared his ownership title & has arranged for his finance requirements, the next step is to actually start the construction of the anticipated property. Though it appears the most cliché and straightforward part of the value chain, but there are ‘n’ number of issues involved in this seemingly simple part too. Researches at many world-class respected Universities have revealed that this phase involves the maximum wastage – both in terms of time & money. As is apparent from the above flowchart that construction phase is not that simple as it seems to be at the first sight. Due to multiple sub-phases, the amount of delays and wastes increases exponentially in this level. The construction phase provides a lot of opportunity to improve the supply chain inefficiencies and reduce the project cost to a large extent. The multiple iterations incurred at the design phase can be reduced if there is a specialized agency to take care of it. Again, the raw-material supplies and labor requirements after the Design Phase, if handled appropriately can help the contractor finish off the work more efficiently at a lower cost and lower budget. The design phase should be outsourced instead of being in-house. This is because the expertise of the building contractor is to construct, not to design. Having a specialized design agency will remove the redundant steps in this phase and come up with better and more efficient designs. Although many of the construction works being carried out these days uses this approach only, but still major chunk doesn't. 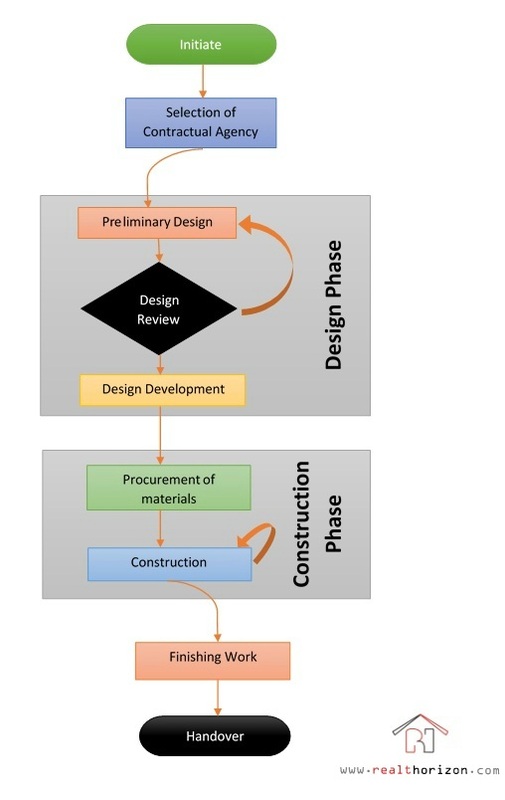 Supply chain in the construction phase can be improved to a large extent if the procurement system can be tightened. The world is moving towards just-in-time (JIT) technique where only that much raw material is procured at a time as is required. But still this is absent in the real estate domain. Contractors still go for bulk purchases due to which a lot of wastage happens. PS: There is lot to the above discussion which can be helpful for RealT apart from the above 2 points. In India, apart from the lack of ownership and proper financing, this phase requires maximum attention and through RealT Horizon, we will try to bring some of those aspects in the front.